Two ways to subscribe to The Voice! For nearly 20 years, we’ve brought you stories that you won’t see anywhere else — breaking environmental news and investigations, thoughtful commentary, and refreshing tales that celebrate Appalachia’s natural and cultural heritage. 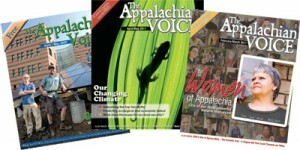 Now there are two ways you can receive the bimonthly Appalachian Voice. We distribute approximately 65,000 copies of The Appalachian Voice throughout an eight-state region and beyond, thanks to the support of Appalachian Voices members. Keep us on the newsstands — become a member today and receive a one-year, 6-issue subscription delivered to your mailbox. Sign up below to receive notifications when each issue of The Appalachian Voice is published online!